1. How to create a custom widget? Every user can create their own custom widgets in Kanbanize to pin crucial information from their account directly on the Dashboard. 1.1 You can create a custom widget via the Advanced Search feature (the magnifying glass) at the top of your board interface. With this feature, you can filter and configure your data to get the specific information you need from your account. 1.2. Use the Refine search criteria option to filter the information you wish to display in the widget. You can create a widget that displays all cards on a given board with a certain tag. To narrow down your search in the account -> open the Refine search panel and select the pills "Tags" and "Board". - enter the Tag value in the respective text field (Tag is). 1.4 Click on the Search button (img.1) to run the report and you will get the results in a table format (img.2). 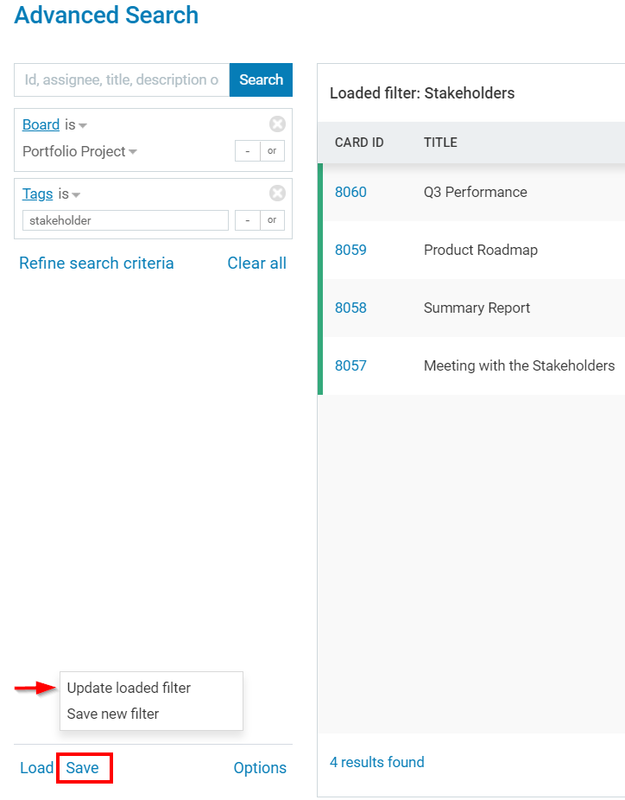 1.5 You can configure your search to display more details in the report -> select the Configure Results button on the top right corner of the panel and select the pills that you want to add in the report. 1.6 To save the filter as a widget -> select the Pin to Dashboard icon at the bottom right side of the panel. 1.7 In order to pin this widget to the dashboard, you need to save it as a new filter first. 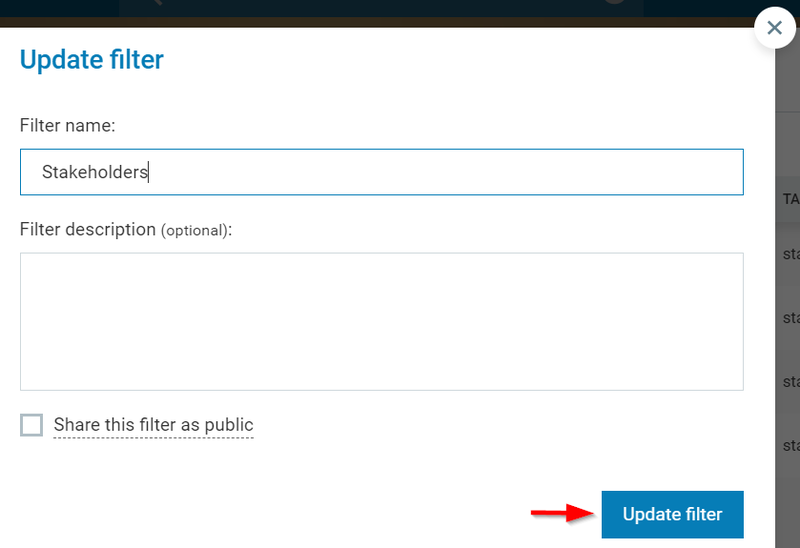 Just enter the Filter name and click: Save and pin widget. 1.8. Open the dashboard and you will see the widget to the right side of the screen. 2. How to Edit/Update Custom Widgets? 2.1 Click on the Widget's menu (the three dotted icon) and select Settings. 2.2 When the Advanced Search panel opens, just make the changes using the Filters (Refine/Configure) -> then select Save at the bottom left side of the panel -> and Update loaded filter. 2.3 The system prompts you to confirm the changes -> select "Update filter" and the widget on your dashboard will be instantly changed. Note: Read more to find out how to add a predefined widget. The Advanced Search Panel. How to generate reports in Kanbanize? How to create and share a public filter via the Advanced Search? How to import cards using Excel?